Windows OS in Yoga Tablet! Lenovo has recently launched four tablets. Among them we also have a Yoga tablet 2 with Windows which adapts to you for videos, music, gaming, web and more. The tablet features kickstand which is an utter delight for the comfort of the users. You can stand, tilt, hold and even hang the tablet according to your preference. Watching movies, playing music, playing games, surfing the web and socializing has been brought up to a whole new level by the kickstand feature. The Yoga tablet 2 with Windows features an impressive 8-inch Full HD 1920×1200 pixel IPS display which is decent enough to give superb performance at displaying pictures and watching movies. The device is powered by a quad core Intel® Atom™ Processor Z3745 which can deliver seeds of up to 1.86 GHz. The processor is coupled up with 2GB of LPDDR3 RAM which offers seamless and fluid experience. On the storage side the device has 32GB of in built ROM which is further expandable to 64 GB by the help of micro SD card. The primary snapper of the device is of 8 MPix with Auto focus and wide aperture f 2.2 lens. The device is also equipped with a 1.6 MPix HD camera for capturing selfies. On the connectivity side, the device has Dual band 802.11a/b/g/n Wi-Fi with 3G/4G for data connectivity along with the basic connectivity options as well. The device is fabricated with Twin Dolby®-enhanced, large-chamber front speakers for seamless audio experience. The device is powered by massive battery which can power up the device for up to 15 hours. The tablet runs on the latest Windows 8.1. Microsoft Office 365 is also provided with the OS with free 1 year subscription for handling your documents, spreadsheets and others. The Yoga tablet 2 with Windows is on sale exclusively at Flipkart at just INR 34,990. So don’t wait, grab this impressive tablet as soon as possible. 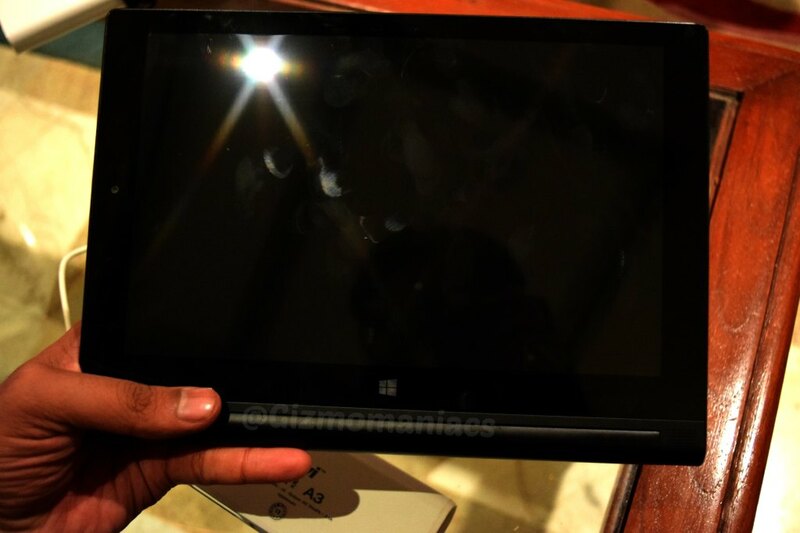 Check the Hands on video of Lenovo Yoga Tablet 2 (8-inch) Windows.